Color, 1988, 94 mins. 49 secs. As Italian horror began to wane in the late 1980s, word of a sequel to Lucio Fulci's seminal Zombie (known as Zombi 2 in Europe) helmed by the maestro himself caused fans to salivate in anticipation. Unfortunately circumstances caused by either health or disinterest (depending on whom you ask) forced him to leave the production, and the, um, idiosyncratic Bruno Mattei and Claudio Fragasso took the reins to complete the film. The disbelief that met the final product largely sprang from the Fulci name emblazoned on the credits, though if approached as more of an unofficial sequel to Mattei's Hell of the Living Dead filtered through the slumming sensibility of late-period Fulci, Zombi 3 is much easier to, well, digest. 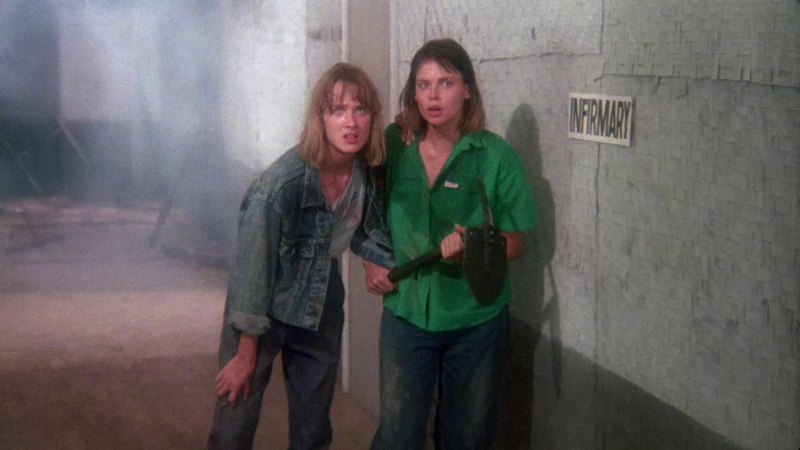 Driven more by gleeful insanity than cinematic skill, Zombi 3 kicks off with the theft of a top secret freezer unit via helicopter which results in a deadly toxin leaking across the countryside. The military attempts to cover up the potential disaster but, thanks to the handy process of cremation (shades of Return of the Living Dead), produces a flock of contaminated birds which spread the contagion. Soon both the military and zombies are rampaging through the jungle while a ragtag band of survivors - namely a trio of G.I.s and some hapless teenage girls - fend for their lives against the flesh-munching dead while a local disc jockey offers profound commentary that puts Vanishing Point to shame. 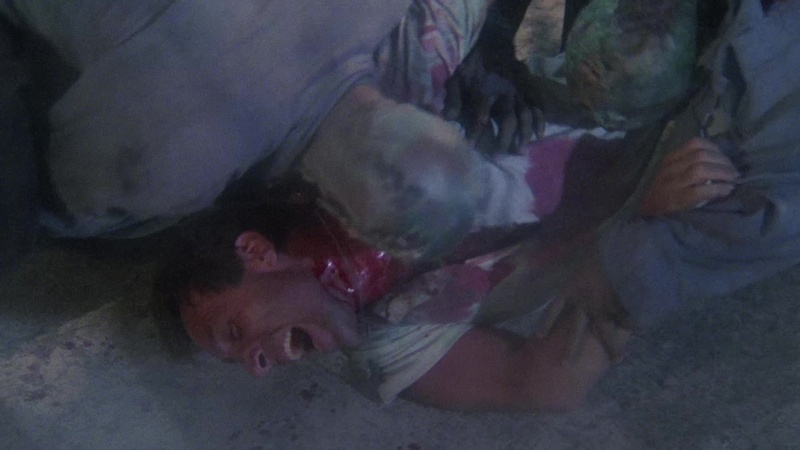 Basically one long chase scene punctuated by outrageously giddy dialogue and such oddball sights as a flying, skin-chomping zombie head, Zombi 3 falls short when it comes to such disposable factors as coherent dialogue and continuity. As with the similarly junky Nightmare City and Mattei's previous flesh-muncher favorite, the zombies themselves provide most of the fun as they seem to change behavioral patterns and raison d'etre every five minutes. They shamble, leap from rafters, craftily hide in haystacks, and go leaping after helicopters, much to the audience's amusement. 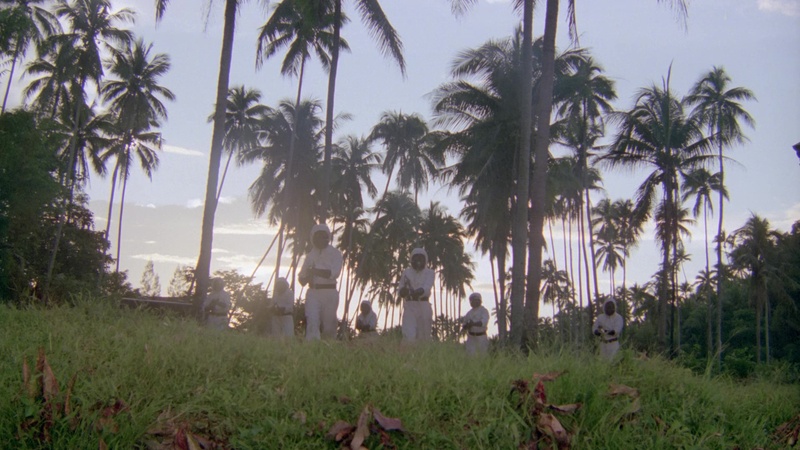 Aside from obviously being affordable, the Philippines shooting location (supposedly in the same village from Apocalypse Now) provides a variety of settings and allows the story to cross-cut to its heart's content even when there's no actual reason for it. Dippy, badly dubbed fun to be sure, though the bizarre downplaying of gore is impossible to excuse. There's some munching, hacking, and bullet squibs, but given both director's track records, it's peculiar to see the comparative dryness of the end result. 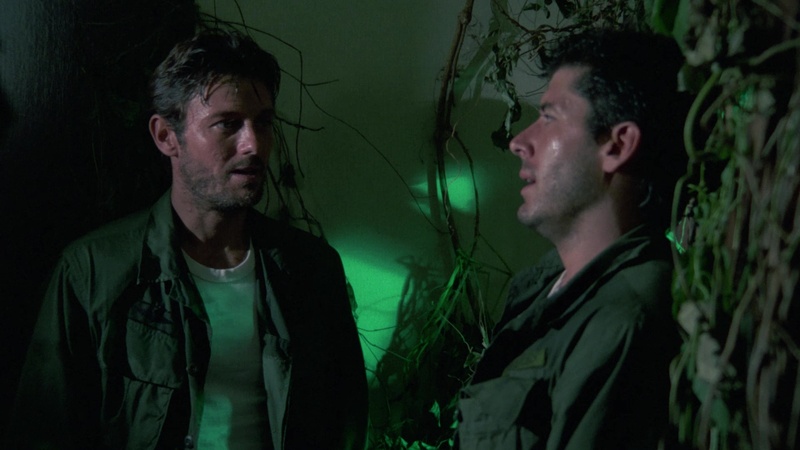 It certainly can't hold a candle to the original and unforgettably moist Zombie, a precursor in name only. Given the increasing difficulty of landing Italian product in English-speaking theaters, it's hardly surprising that Zombi 3 never enjoyed the widespread release of its predecessors. 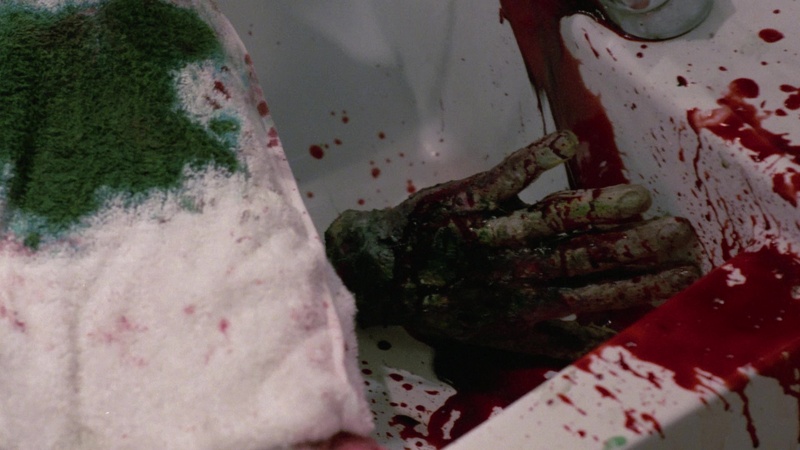 Most fans became acquainted with its dopey charms via bootleg copies and the scarce Japanese release, which featured a three and a half minute opener detailing the revival of an encased corpse. (It's also the most stylish sequence of the film, drenched in Argento-like reds and blues.) Other video releases simply kicked in with the main titles, which doesn't do much damage to the already senseless story but feels too abrupt all the same. Shriek Show's DVD from 2002 grafts a one-inch video edition of the prologue onto a superior anamorphic transfer of the film's interneg with poor quality inserts stuck in (not always fully intact) for whatever bits were missing. The bulk of the film looks solid and film-like enough for the time; expect lots of greens and browns here. 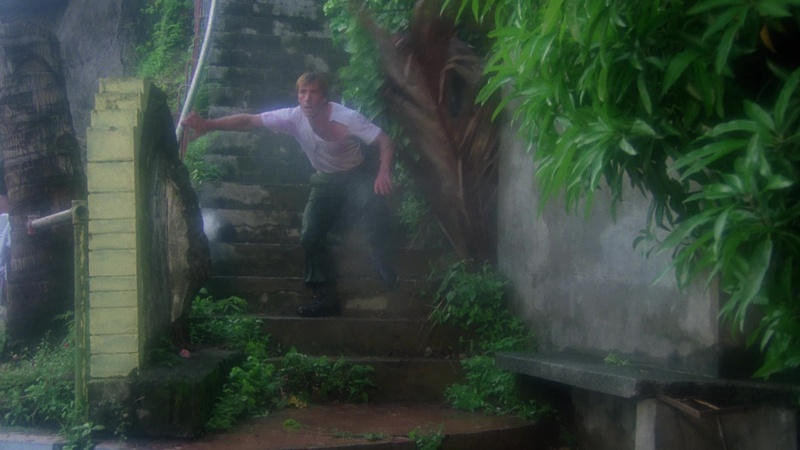 Whether it's considered a late period Fulci or a middle of the road Mattei, Zombi 3 looks like standard late '80s low budget Italian product with its dull cinematography and ham-fisted editing style. The audio sounds fine considering the canned voices, which sometimes match the lip movements and spout out one quote-worthy inanity after another. The droning and hilariously dated synth score, which sounds like outtakes from The A-Team, is also well rendered for what it is. The old adage about making lemonade from lemons certainly applies to Shriek Show's DVD, which offers a fascinating and sometimes hilarious look at how a potential Eurohorror classic could derail so completely. Mattei ("I think all of my films are ugly"), writer/producer Claudio Fragasso, and actors Ottaviano Dell'Acqua, Massiomo Vanni, and Marina Loi are all on hand to offer on-camera interviews about their experiences with the film, which was seemingly cursed from its inception. They finally set the record straight about Fulci's involvement; he shot a 70-minute film and declared it completed, but only 50 minutes of his work was usable. When Fulci refused to return for reshoots, Fragasso recruited Mattei for some emergency cinematic surgery. 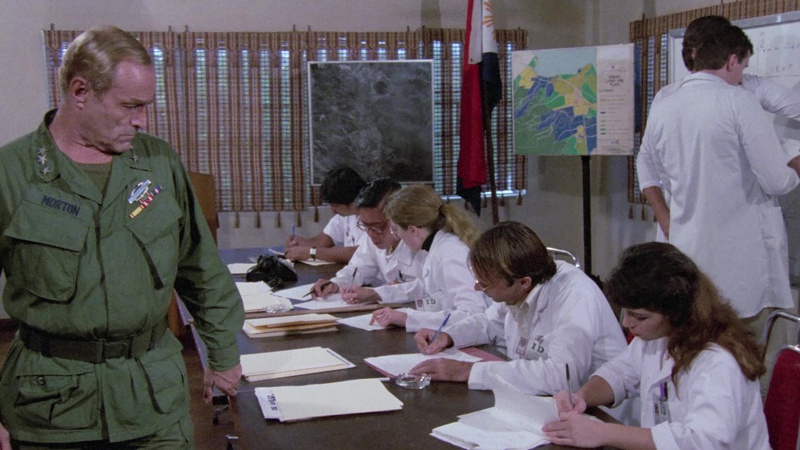 Mattei takes credit for the footage of men in white contamination suits and sundry other details, but apparently the bulk of the film can legitimately be credited to Fulci. Fragasso has the longest interview (18 minutes), while the others range between 6 to 10 minutes each. The actors mainly offer friendly anecdotes about shooting, with Fulci described as alternately witty and monstrous. Other extras include a gallery of posters and lobby cards and the lively theatrical trailer. In a confusing move, Shriek Show issued another edition less than a year later in 2003, adding on a fun, sometimes ridiculous audio commentary with Sarafian and Ring (who still seem pretty bemused by the whole thing), plus a bonus featurette with makeup artist Franco Di Girolamo. Image-wise the release was later trounced by the 2015 UK edition from 88 Films on Blu-ray and DVD, under the title Zombie Flesh Eaters 2. Apart from some noise reduction that softens things a bit and tones down the grain more than what would be ideal, it looks gorgeous all things considered and way better than you'd expect for this film. 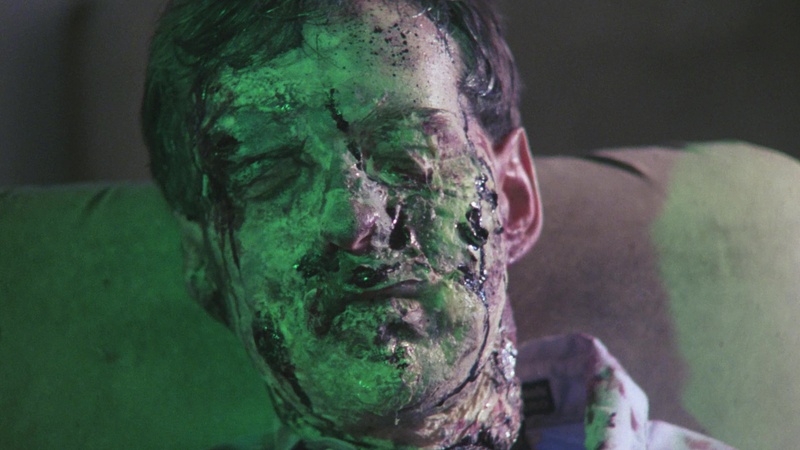 It's also easier than ever to peg what Fulci directed thanks to those vibrant, tell-tale emerald green highlights put in all of his scenes, and even the prologue now looks pristine for the first time. Extras include a different Dell'Acqua interview (8m10s), a half-hour Q&A with Fulci star Catriona MacColl (which has nothing to do with this film but makes for fun viewing), a "Zombi Reflections" interview (16m25s) with Ring, a new interview with Fragasso (17m22s), the Italian main and end titles, and a trailer reel. Of course, it was only a matter of time before Zombi 3 came back to America, and in 2018 that came to pass from Severin Films under the Anglicized title of Zombie 3. The preexisting Sarafian and Ring commentary has been ported over, while the older interviews have been streamlined and resubtitled into more easily digestible supplements, namely "Tough Guys" (4m55s) with Vanni and Dell'Acqua, "The Problem Solver" (8m30s) with Mattei, "Swimming with Zombies" (4m30s) with Loi, and "In the Zombie Factory" (5m56s) with Girolamo. The older Fragasso interview has been replaced here with the new "The Last Zombies" (18m49s) in which he's joined by wife and co-writer Rossella Drudi, from what appears to be the same session that yielded their chats for Violence in a Women's Prison and Zombie 4: After Death (complete with that cuddly, scene-stealing tabby cat again). They're great company as always as they recall Fulci's health issues, the rewriting process, and the triage they and Mattei had to do without the original cast. (Also, check out that spooky reflection in the window over Fragasso's shoulder.) The usual English trailer is also included. The transfer is touted as a new 2K scan and is indeed complete, putting it ahead of the Media Blasters and about even with the 88 Films. 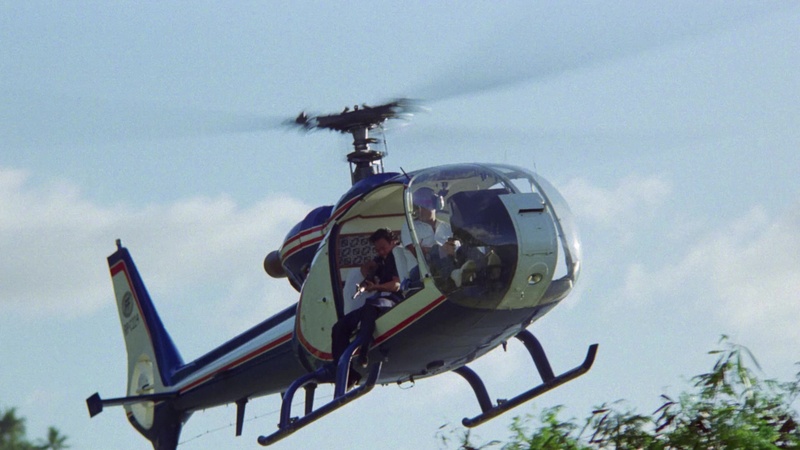 The appearance here is grainier and more filmic by comparison, but unfortunately it also has very obvious compression issues that give it a chunky, unnatural veneer, most obviously in outdoor scenes when things like helicopter blades, the sky, and fog descend into macroblocking galore. (And this film has a lot of fog.) On the other hand, colors look great and often psychedelic in their intensity, and the darker interior scenes are nicely rendered with more depth and detail than ever before. (Frame grabs in this review are from the Severin release; comparison ones should hopefully be up here shortly.) The DTS-HD MA English mono audio sounds about the same as always -- canned and tinny, but it is what it is. Of course, you have multiple buying options here including a Blu-ray or DVD or part of The Zombie Dark Deluxe Bundle or The Zombie Dark Super Deluxe Bundle. The first 3,000 units of the Blu-ray also come with a soundtrack CD, replicating the contents of the usual Beat Records CD including the score by Mainetti and the utterly ridiculous songs by Clue in the Crew like "The Sound of Fear." Updated review on May 24, 2018.